Soon it will have been nine years since Ian Shepherd declared the Dynamic Range Day. Has something changed? Why do I feel that nobody really cares about this issue? Do recordings with a decent dynamic range belong solely to the high end audio world of audiophiles? 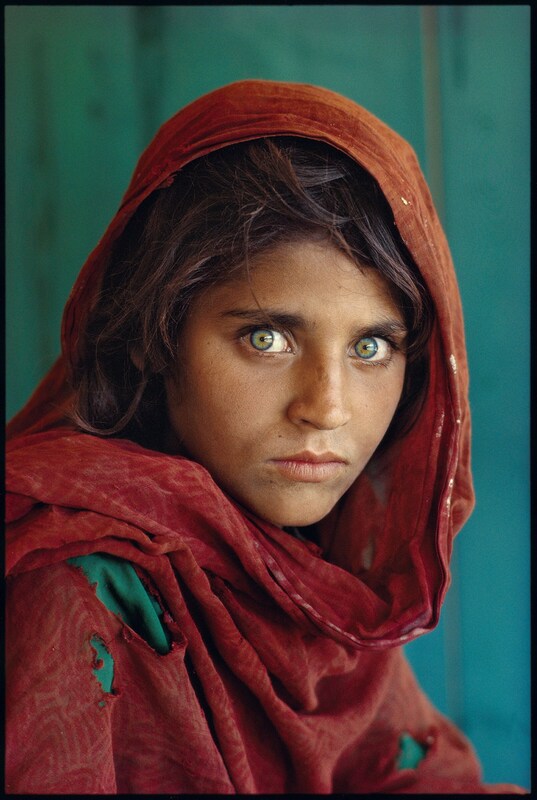 In 1980, Steve McCurry took a photo of a twelve years old girl Sharbat in a Pakistani refugee camp. She lost her parents in the Afghan War. The photo has made McCurry famous primarily because of the impeccable capture of the atmosphere, the girl’s story, inscribed in her piercing blue-green eyes. The technical details of the photograph—the light, composition, depth of field, are also important. All of this combined forms an immaculate work of art, which endures the test of time. In 2008, the legendary Metallica released their ninth studio album Death Magnetic made at Warner Bros. Records. The bass drums resemble plopping and the guitars a swarm of pissed bumblebees. Do artists of this calibre qualify for something like that? As a fan of Metallica, I know I was not the only one to be greatly disappointed. Quality and technical details would be my preference to a soulless mainstream. Would Steve McCurry put a fuzzy photo on display? Miles Davis said that the most interesting part of music, for him personally, was silence. It is silence that forms tension in music, the duality with sound and tone. In an interview for the Rolling Stone magazine, Bob Dylan said that contemporary recordings were terrible—a sound wall, without definition, with nothing—just static. It has been more than a half of a century since big recording companies noticed the simple fact that when choosing songs, people preferred louder recordings to quieter ones. But the innocent marketing idea of nudging the artist closer to the listener has over time turned into a phenomenon, now known to the informed public as the Loudness War. Psychoacoustic research has empirically shown that louder music simply sounds better to people. In his book Mastering Audio, sound engineer Bob Katz states: “The problem of psychoacoustics [perception of music] is that when two identical programs are presented with slightly different volume, the louder program always sounds better.” The reason for this fact is not precisely clarified. One of the causes could be the fact that loud music increases the neural activity in our hearing centre, thus qualitatively changing the entire state of our brain. In his article The Seductive (Yet Destructive) Appeal of Loud Music, Barry Blesser concretizes the issue: “Loud music activates the same brain centers as consuming euphoria-inducing drugs (such as cocaine) does. There is evidence that the perception of music raises the level of endorphins associated with brain centers of pleasure.” He also notes that when it comes to intensity, the span between pleasure and destruction is extremely small. In the brain, loud music has an effect not dissimilar to that of drugs. That may be why our brain subconsciously prefers the more intensive acoustic perception. And the advocates of loud recordings with low dynamic range have another argument. : More and more people are listening to music away from home—in headphones and in noisy environments. A louder recording without subdued elements is then more audible. Such music can be listened to as a “backdrop”—its micro and macrodynamics do not “disturb” as much. However, the main motive came primarily from recording companies that publish the music. Louder music with suppressed dynamics is simply more audible when played on the radio. In the process of the creation of a musical work, mastering comes as the last and a seemingly unimportant step. Nevertheless, it has a significant influence on the overall nature of the recording. Mastering is responsible for the final tweaking of an otherwise finished work. The proportions of individual instrument sounds are not changed, but the colour and levels of individual frequencies are being tuned. Dynamic compression is applied. It helps to enhance the properties of individual instruments and vocals or mask mistakes in the interpretation. However, it can also be used to increase the overall volume of the recording. The volume of quieter sounds is being increased, the volume of louder sounds decreased. The dynamic range (DR) is a fundamental detail. It determines the average difference between the loudest and most quiet part of a recording. Once, a common dynamic range of a rock album was 15 dB. Today, with similar albums, it is down to around 6 dB. The dynamic range is, of course, predetermined by the nature of the song itself. Nevertheless, it is worth noting that even the most bawling punk has its inner microdynamics. What is the actual problem with loud albums? They lack depth, colour and dynamics; in the better scenario. The worse one (quite common these days) is the introduction of strong distortion. We can hear digital clipping, the mids are muffled and flow into one another, the heights, on the other hand, display an unpleasant hiss. As long as making a record play as loud as possible on all types of players stays the ultimate goal of mastering, your new hifi set or quality headphones cannot really bring what is intended. The full joy of art is simply not there if the recording sounds the same as when played from a mobile phone. That leads us to a question of almost philosophical proportions: do we want to listen to music, or consume it? Let’s consider a typical recording from the 1960s. The medium that is the closest to the actual recording session in a studio is an analog multitrack tape. From that, multiple analog masters had been created over time (owing to technology limitations always with some loss in quality) for vinyl releases. A number of such masters can exist and not all of them have to be copies of the original tape, but also copies of copies. A few decades later, with the arrival of CDs, a digital master was created. Its quality was predetermined not only by the source (that is any of the analog copies or the original tape—this applies even today), but also the technology of the transfer to digital. The technology has, however, significantly advanced since the time CDs were introduced. Only for the last few years it has been possible to obtain a digital master of a quality equal to the quality of the original tape. Therefore remastering may be a chance to “come the closest” to the original recorded performance. It does not have to be as this is dependent on the source of the master, the interpretation of a song by the person doing additional mixing, and then on the final mastering, in the sense of tweaking the sound. If killing the record by the trendy application of dynamic compression is involved, a rather paradoxical situation can arise. : A few decades old vinyl release can sound better, even with its noise. The original with more dynamic range (up) but small overall volume boost. 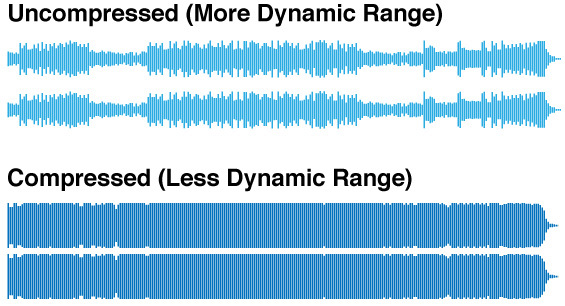 An identical record with compressed dynamic range, and more volume boost. Some anger of fans throughout music genres has turned against mastering engineers. Some has not. One cannot but try choosing artist who avoid the Loudness War trend. There are also companies that decided not to jump on the bandwagon… It is worth to mention another paradox here—music outside the popular, or “mainstream” flow tends to get released by such, usually smaller, companies. The other option is buying vinyl. The physical grooving limits the use of dynamic compression, to a certain extent. Not everybody favors analog, though. Above that, if the vinyl release is sourced from the same dynamically compressed master as the CD (not a rule, but not an exception), then although the vinyl will not be so loud, the problems will persist. There is a large community of listeners and people from the recording industry background, who decided to actively defend themselves. The Dynamic Range Day is just one of the outcomes. Other include numerous artist databases, forums dealing with the quality of releases, the concept of sound certificates, or the emergence of software for easy measuring of dynamic range. I believe that with greater awareness of artists themselves, there will be more technically good releases without suppressed dynamics. The artist himself can decide whether to leave the dynamics relatively uncpmpressed and be “quieter” than others. I believe that there will be more “quieter” but quality and dynamic releases for those who wish to close their eyes while listening and let themselves be carried away by the atmosphere of the art that music is.